Injury—the word alone is enough to strike fear into the heart of any athlete. We're in our fitness groove, setting personal bests and seeing results, only to find ourselves suddenly sidelined by unexpected pain. But rather than being depressed about the gym sessions we're missing, we can take this opportunity to analyze why the injury occurred and how to make sure it doesn't happen again. 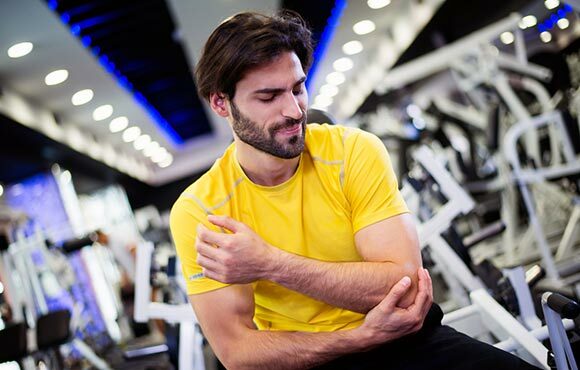 Here are 10 of the most common workout injuries—plus crucial tips on how to prevent them. Pain that seems to radiate along the inner edge of your shinbone (or tibia) may be a sign of media tibial stress syndrome—more popularly known as "shin splints." Common in runners, and athletes that do a lot of running and jumping, shin splints occurs when overstressed muscles in the front lower leg cause pain along the shinbone. This muscle inflammation can crop up after only a few workouts, and the risk becomes especially high if you've recently increased the intensity or frequency of your training. Running hills or on hard surfaces (such as concrete or asphalt) or training in worn-out shoes also increases your risk. How to prevent it: Wear proper shoes that are in good condition and gradually increase the intensity and frequency of your workouts. Warm-up before any hard training sessions to ensure you get the blood moving and prep those lower leg muscles for intense effort. A vague discomfort around the kneecap can signal knee patellofemoral syndrome, also known as "runner's knee." 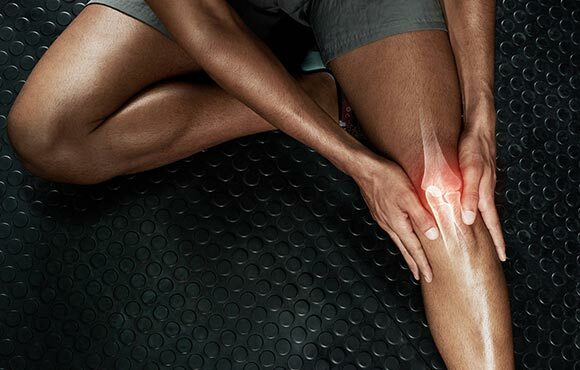 Often related to poor tracking of the patella, you may hear a creaking, crunching or grating sound as your knee moves through a normal range of motion. Muscle imbalances can exacerbate the issue, as can performing weighted repetitions with compromised form and improper knee alignment. Using weights that are too heavy or performing too many repetitions can also damage the knee extensors and cause pain. For runners, knee pain may crop up after running hillier routes as downhills can increase stress to the patellar tendon. How to prevent it: Weak hips and abductors can cause the knee to track inward during squats and lunges, or while running and jumping, which places strain on the patellar tendon. Keep your knees healthy by focusing on exercises that strengthen the hips and quadriceps. Also, when weightlifting, focus on keeping the knees in proper alignment to protect the extensors and strengthen the surrounding muscles. The wrist is a complex joint with a high degree of mobility, but high mobility and instability often go hand-in-hand. One too many barbells curls with a straight bar, or a workout with a ton of push-ups, can overload the wrist and strain the surrounding muscles. Front squats and other exercises that require significant shoulder mobility to keep the weight off the wrists can also place unwanted stress on the area. How to prevent it: Rather than focus on heavy lifts to strengthen the wrists, try targeting the smaller, stabilizing muscles. Kettlebell swings and cleans can help, as well as wrist rotation exercises and wrist extensions with a Theraband. A common injury for runners and cyclists, iliotibial band syndrome (ITBS) occurs when the IT band (a band of ligaments that runs along the outside of the leg from the knee to the hip) becomes tight and inflamed. 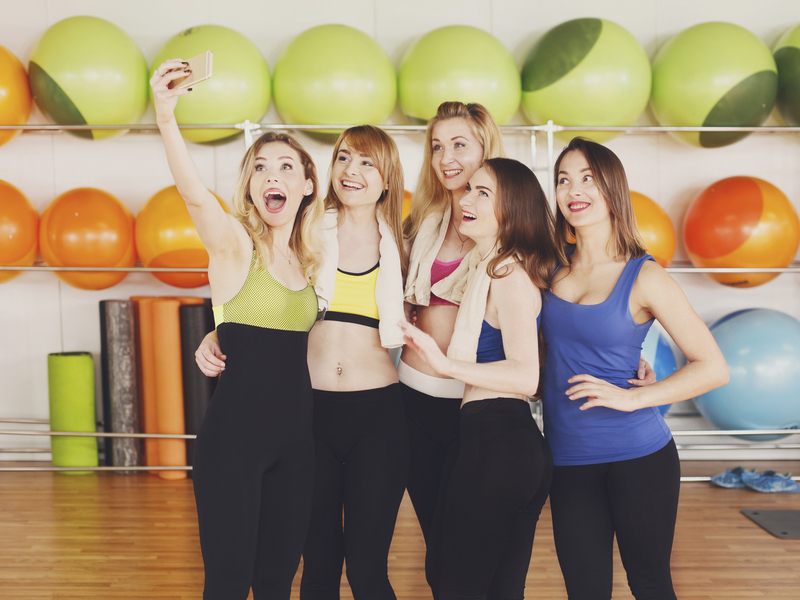 You'll likely notice pain at the hip or on the outside of the knee, which may increase with repetitive motion that impact the IT band, such as cycling or spin classes. ITBS may be caused by overuse, a rapid increase in mileage or a result of running on uneven or banked surfaces. Old, unsupportive footwear can also contribute to ITBS. How to prevent it: If you are a runner, make sure your footwear is in good condition, and increase your mileage slowly and safely. Try to vary your routes so that you avoid running the same direction too many times. Cyclists should make sure the seat height is appropriate (not too high or low) and their torso is in a good position to allow proper alignment of the hip and leg on each pedal stroke. The rotator cuff is a group of four muscles that support and stabilize the shoulder joint. Over time, repetitive overhead movements such as military presses, or activities that require a lot of shoulder mobility (such as throwing a ball or swimming), can lead to a rotator cuff strain. As you age, your risk increases as the tendons begin to degenerate. How to prevent it: Incorporate strengthening exercises for the rotator cuff into your upper-body program. Maintain good posture (a slouched position compresses the shoulder joint) and avoid repetitive overheard movements with weights that are too heavy. Focus on selecting weights that are light enough to allow the rotator cuff muscles to work without relying on the deltoids and pectoral muscles. 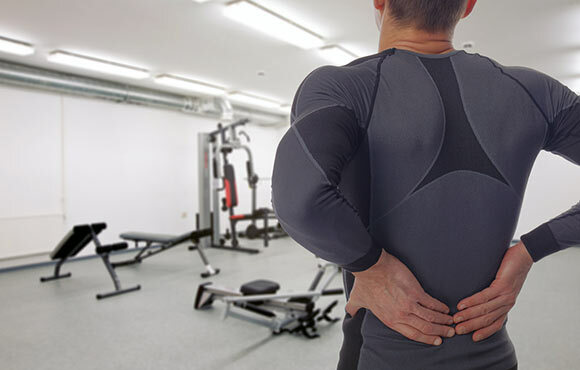 Low back pain during a workout may be a sign that you've strained the muscles surrounding the spine. If you feel a sudden twinge or pulling sensation, you've likely pushed beyond your limits, which can even lead to nerve compression or disk herniation. Squats or deadlifts with improper form (or too much weight) are the big culprits for low back injuries, but twisting motions or sideways bends can also place strain on the area. How to prevent it: Make sure you are maintaining a neutral spine when you lift. Correct your form before performing any exercise with added weights, and make sure to increase your load gradually over time. If you are unsure of proper form, ask a qualified personal trainer for assistance. Twisting an ankle doesn't always happen on a run. Any single-leg exercise poses a risk. The ankle is a very mobile joint, but when the foot turns inward and the joint rolls too far, it can tear the ligaments that are on the outside of the ankle. Running on a treadmill can especially put you at risk for a sprain as you may lose your focus and place one foot on the side and one foot on the belt while it's still in motion. Runners who prefer the outdoors aren't immune either--running over uneven terrain or stepping off and on curbs can increase your risk of a sprain. How to prevent it: Reduce your risk for a sprain by performing ankle flexibility exercises and work on strengthening the muscles in the lower leg and foot. When running on a treadmill, exercise caution in getting on and off the belt and, if available, attach the safety clip that shuts the machine off if you fall. When running outdoors, aim for flatter, level surfaces and keep a close eye on foot placement when you run over challenging terrain. Elbow pain can show up in a number of ways, but the most common injury is lateral epicondylitis or "tennis elbow." Even if you don't play tennis, this tendonitis can crop up after using weights that are too heavy, performing identical exercises every time you workout or utilizing improper technique. Weightlifters may irritate the tendon by performing an exaggerated wrist flexion at the end of a bicep curl, lat pull down or seated row. How to prevent it: Keeping your wrist in a neutral position while lifting can go a long way towards minimizing your risk. Avoid overly fast repetitions, decrease the weight you are using (if you feel strain) and introduce exercises into your routine that strengthen the wrist extensors. Performing one heavy bench press too many can take you from strengthening your chest to straining it. A pectoral strain or tear is usually a result of a sudden overload to the tissue, usually in a bench press or chest-fly motion. How to prevent it: Work up to your bench press weight slowly and gradually over time. 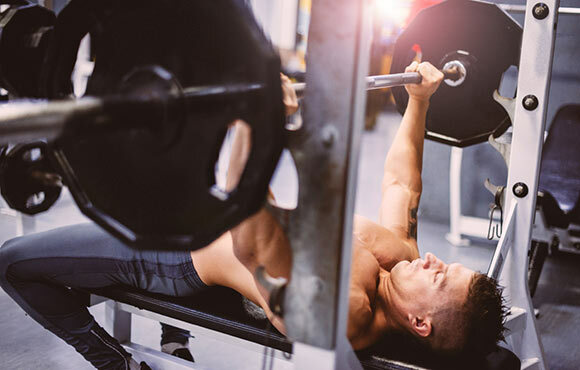 Avoid explosive bench press movements with heavy weights. When you lift heavy, request a spotter to ensure that you don't drop the weight or lose control. If your wrists or hands shake when you lift, it's a dead giveaway that you need to lower your weight. Groin pulls are fairly common and can occur during squats, lunges or while sprinting. A sudden movement that pushes the muscles a bit too far and—ouch!—the workout is over as you hobble out of the gym. Your risk also increases as you age, since the muscles and tissues lose some of their elasticity. How to prevent it: Make sure to warm up the inner thigh muscles (adductors) before working out. Start with some gentle walking, jogging or cycling to warm up the muscles before performing any sprints or plyometric movements. 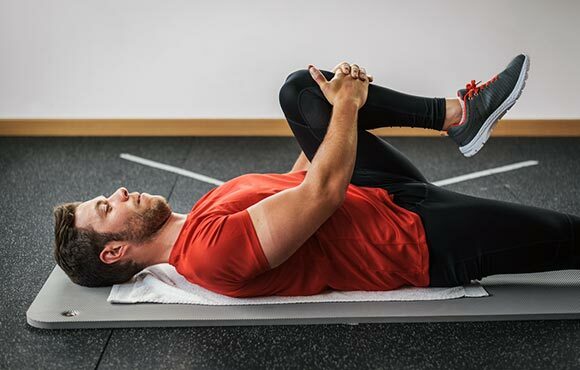 Including adductor strengthening exercises such as leg raises and clamshells in your lower body routine will also go a long way towards keeping you injury-free.